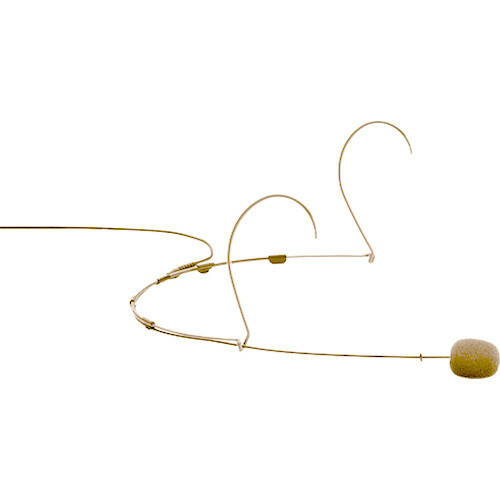 The medium, beige d:fine Core 4088 Directional Headset Microphone with Hardwired 3-Pin LEMO Connector from DPA Microphones is designed for theater and broadcast applications. The Core 4088 microphone delivers a 14 dB increase in both THD (total harmonic distortion) and dynamic range, which improves clarity and openness more than the previous Legacy model. The headworn cardioid microphone is a dual-ear design that can be worn on either ear and used for various performing talent applications. Its small, 0.25" diameter allows for discreet use while its 0.5-ounce body allows for comfort while being worn. In addition, a foam windscreen, makeup cover, clothing clip, and a pop screen are also included. The d:fine Core 4088 gets a 14 dB increase in both THD and dynamic range.